What is unstructured data exactly? Organizations generate a ton of data! Documents, text, graphics, pictures, audio, web pages and more…. . In any organization, there is a difficult balance between being having too many human capital resources and too few. This problem is especially pronounced in larger companies, where it is impossible for everyone to know what everyone else is doing. One of the biggest challenges that companies face is the effort to understand the status and state-of-progress of their business initiatives, programs, and key projects. 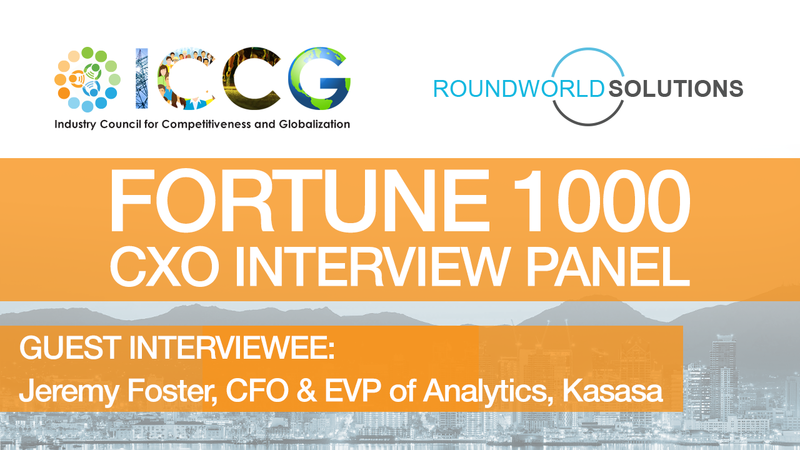 This CXO video interview features panelist, Jeremy Foster, CFO & EVP of Analytics at Kasasa, & addresses issues surrounding the effect of Business Intelligence, Big Data, and Analytics technologies within the finance sector. “Data governance is not a one-size-fits-all endeavor, but instead must customizable, flexible and agile, allowing for varying degrees of access to as much data as possible, in an organized fashion.,” says AJ Sarkar, CEO of RoundWorld Solutions. This CXO video interview features panelist, Tina Lai Liedtky of Alere, and addresses issues surrounding the effect of technology on global marketing and product development. “For data governance in this sector to succeed, life sciences companies must collaborate with technology providers and regulatory agencies to develop ways to evaluate data in a meaningful way while also providing robust quality assurance and workflow management,” says AJ Sarkar, CEO of RoundWorld Solutions. “To succeed in the data-driven economy, those in the manufacturing sector must look toward data as a both a predictive and a prescriptive force for decision-making,” says AJ Sarkar, CEO of RoundWorld Solutions. “To be effective, a data governance solution should classify data, evaluate risk, pinpoint any chinks in the security compliance armor and create processes for resolving data issues, while also setting parameters for usage in a systematic and proactive way,” says AJ Sarkar, CEO of Roundworld Solutions. “We can work with you to account for and address problems common to efforts in data governance — including multiple siloed databases, insufficient infrastructure and a lack of cultural buy-in — in order to provide consistent, accurate and trusted enterprise-scale analytic insights,” says AJ Sarkar, CEO of Roundworld Solutions. “By utilizing the RoundWorld Solutions (RWS) Big Data 360-degree view tool, healthcare organizations can develop a full disaster recovery/business continuity plan that allows access to data, ensures quality patient care and maintains cost benefits and savings.” says AJ Sarkar, CEO of Roundworld Solutions. In a cyber-threatened world where a single keystroke can mean the difference between data security and certain disaster, the life sciences sector is in particular peril. Although Big Data analytics for data-driven fields. “Round World Solutions’ Big Data 360-degree Tool can assist CXOs as they take effective measures to both prevent and mitigate cyber attacks by criminal organizations, hacktivists and espionage units worldwide.” says AJ Sarkar, CEO of Roundworld Solutions. Over the past decade, Big Data has proven to be an invaluable resource for streamlining and optimizing global manufacturing operations in a variety of industries. Big Data initiatives in retail need to integrate a motley structured and unstructured data coming from many sources. The biggest challenge will be to align these data sources to sales and marketing business goals for each of these organizations. Globalization (ICCG) Releases the Fortune 1000 CXO Video Vault expert knowledge on Data Governance by David Silberstein of Leidos Healthcare. Fortune 1000 CXO Video Vault program launched by the Industry Council for Competitiveness and Globalization (iccgusa.com) that includes access to streaming media clips of CIO interview on current topics, like trends in Business Intelligence, Data governance, Data Analytics, and IT practices that affect the C-Suite. t’s fitting that the Pacific shore was the setting for the latest session in the ongoing series of conferences of CXOs sponsored the Industry Council for Competitiveness and Globalization (ICCG), given that the two emerging trends on everyone’s minds- Big Data and supply chain analytics- are poised to have huge ramifications. This event brought CXOs from different industries together to identify the common challenges they face within Big Data and supply chain analytics. The focus of the meeting was to bring the CIO’s of the Healthcare and Life Sciences companies based in the Southern California area to formulate what we as a community can do to assure the growth and expansion of the economic ecosystem of Southern California. This video by Ken Lawonn of Sharp Healthcare addresses issues surrounding unstructured data, data governance, and master data management. Ken brings up many compelling issues that are currently facing healthcare companies in terms of their Big Data. The ICCG website hosts the Fortune 1000 CXO Knowledge Video Vault Program which serves a broad audience of C-Suite office bearers and professionals for sharing the innovative and collective knowledge. This video by Ashwin Rangan of ICANN addresses issues surrounding Data Governance, Innovation, and International Connectivity. The Internet Corporation for Assigned Names and Numbers (ICANN) is a nonprofit organization that is responsible for operating the Internet’s DNS and Internet protocols.